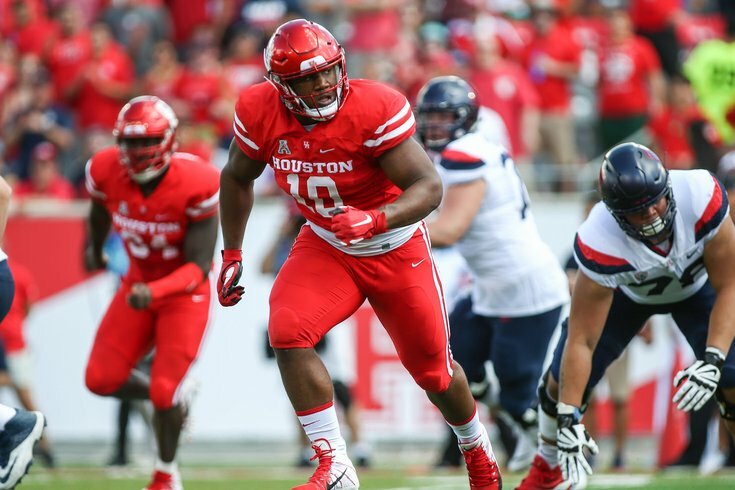 Ed Oliver, along with Fletcher Cox and Malik Jackson, would give the Eagles an elite defensive tackle group. In case you missed our Eagles-only mock drafts 1.0, 2.0, and/or 3.0, you can find them here, here, and here. As a reminder, the Eagles currently have seven draft picks. Let's just get right to it. Trade up! Let's saaaaaay Oliver slips to, saaaaaay, the 18th overall pick, it would make sense for the Eagles to get aggressive and try to trade up to get him. A few weeks ago, we projected what the cost would be to make such a trade, and determined that historically speaking, the cost to move up from the mid-20's into the teens was a third-round pick. Why would the Vikings do this? Well, they desperately need offensive line help, and there should be a number of worthy offensive linemen available at pick 25? Does that work for everyone? No? Well, the math works on the trade value chart, so shut up. Size is why Aaron Donald fell to 13 in the 2014 NFL Draft, and how Geno Atkins somehow fell to the fourth round in 2010. I do think the NFL learned its lesson on that, and isn’t worrying as much about their interior defensive linemen being 6’4, 330. Can they be disruptive? That’s what matters. An interior defensive line featuring Fletcher Cox, Malik Jackson, Oliver, and Treyvon Hester would be a nightmare for many interior offensive lines. Gardner-Johnson played the "Star" position in the Florida defense, which the follow video describes as "a nickel corner on steroids," who toggles back and forth between corner, safety, and linebacker. That is a role similar to that of Malcolm Jenkins, who is now 31 years old and entering his 11th season in the NFL. Gardner-Johnson is a player who could immediately fit in as the third safety (in which case, we hardly knew ye, Andrew Sendejo), with a chance to eventually take over for Jenkins as the full-time starter. • In 2015 as a freshman, Deiter started seven games at LG and six at C.
• In 2016, he started four games at LG and 10 at C.
• In 2017, he started all 14 games at LT.
• In 2018, he moved back to LG and made the Second-Team AP All-American List. Deiter could be a plug-and-play starter at guard in Philly if Brandon Brooks is not yet ready to return by the start of the 2019 season. Even if Brooks is ready to go, the Eagles need more interior OL depth with Stefen Wisniewski moving on. The Eagles kept Nelson Agholor on his fifth-year option in 2019, but it's likely that he'll walk in free agency in 2020. As such, it would make sense for the Eagles to invest in a slot receiver they can develop to take over that role in a year. With Alshon Jeffery and DeSean Jackson working the perimeter, a player with Isabella's speed could present difficult matchups for slower slot corners. He'd be yet another dynamic weapon in an already loaded passing game. Ah, who am I kidding? The Patriots are drafting this guy. One of the more fun running backs to watch from this class is Hill, who is a smaller, shifty runner who makes guys miss. Despite his small size, Hill has carried 632 times for Oklahoma State over the last three years, and has put up good numbers. However, one area where his production is deficient is in the receiving game, as he had just 49 catches for 304 yards (6.2 YPC) and 1 TD in his college career. He is also susceptible to getting steamrolled in pass protection. Ideally, you would prefer a 5'10, 198 pound back to have ability as a receiver, or at least in pass protection, so that they can be used on third down. Hill still has to prove he can do both of those things to become a more complete back in the NFL. Howard, Hill, and Corey Clement would be a nice, diversified trio of runners in the Eagles' backfield. With Brandon Graham and Derek Barnett returning as starters -- and Vinny Curry and (maybe) Chris Long returning as rotational defensive ends -- the Eagles can afford to take a chance on an athletic freak show developmental player, like they did a year ago with Josh Sweat. Of course, if you watch the above video, one of the things that may have jumped out at you is Crosby's lack of muscle definition. Opposing offensive tackles are going to line up against him and will be licking their chops in the run game. With a year or two of NFL weight training under his belt, Crosby could develop into a more complete player, but his ability to stop the run will be in question until then. For now, he's just a sub-package pass rush specialist prospect worth taking a flyer on in the fifth round. Yeah, it's easy to just mock the NDSU quarterback to the Eagles, since they already took one in Carson Wentz, but I do think they'll like Stick for some of the same reasons they liked Wentz. The Eagles have (mostly) brought in big quarterbacks, with a few exceptions, like Joe Callahan, Matt McGloin, and Aaron Murray, who are all listed at 6'1. Where I think Stick will fit most, however, is in "culture" of the Eagles' quarterback room, as described by Jeffrey Lurie at the NFL owners meetings last week. "We’re very conscious of the culture," Lurie said, when asked about the getting back to the strategy of drafting quarterbacks with regularity. "We’ve had an incredible quarterback room, with Carson, Nick, and Nate. It’s one of the reasons they’re all so poised for success. That quarterback that we bring in – let’s say it’s this year’s draft or next year’s draft – it needs to be a great fit in that room, so you’re not just drafting a player that can be a good backup quarterback, but somebody that can help the culture with the quarterback who is starting. You want a relationship that is healthy, where they help each other. That’s a key part of it too. I believe that Nate Sudfeld will be the No. 2 quarterback, but a guy like Stick will present a different type of skill set, and is good enough at what he does to challenge Sudfeld to continue to earn his spot as the backup to Wentz. Meanwhile, the Eagles can work with Stick's mechanics behind the scenes, and perhaps get him to the point where his lack of arm talent isn't a significant hindrance. If they can do that, Stick is a prospect worth developing because of his intelligence and other skills. It seems like every time I write one of these, inevitably someone will say, "Seriously? What about (fill in a position not addressed)?!?" This time around, that'll probably be linebacker. Maybe offensive tackle. Sorry. They only have seven picks. Something will be left out. Also, I think they'll trade for a veteran starting linebacker anyway. So there.